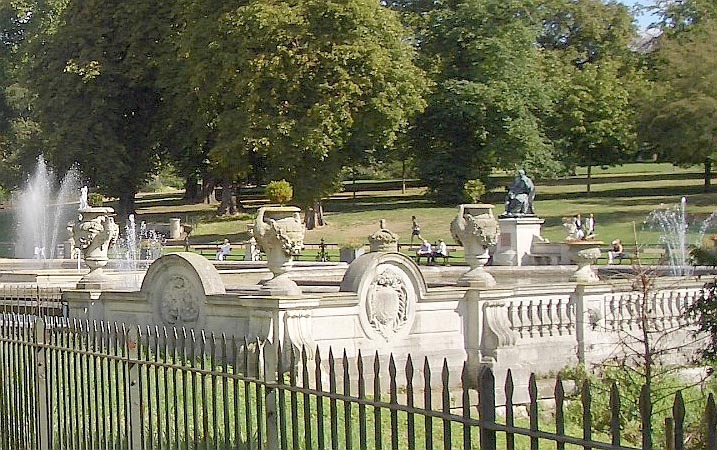 The Italian Garden in Kensington Gardens, London, with the Jenner Memorial (1862) by William Calder Marshall. The Italian Garden was Prince Albert's brain-child, and a top-level team was commissioned to carry it out: the architect and landscaper Sir James Pennethorne (1801-71) designed the layout; Sir Charles Barry, together with Robert Richardson Banks, designed the ornate pumphouse/shelter; and John Thomas (1813-1862) was responsible for the reliefs and sculptures other than William Calder Marshall's Jenner, which, according to the 1996 plaque commemorating Edward Jenner's first smallpox vaccination, this memorial to the great physician "was inaugurated by Prince Albert, the Prince Consort, and the first to be erected in Kensington Gardens in 1862. The cost was met by international subscription."